The Bachmann Big Hauler is a very popular engine, primarily because it is visually attractive and they can be usually found real cheap. However, the Big Hauler is intended to be a low cost mass manufactured engine and therefore isn't built to be highly durable. This doesn't mean that the Big Hauler is a total piece of junk. It takes a little work, but it can be made to run long and well. 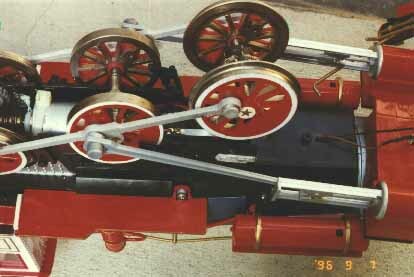 The Big Hauler has a 4-6-0 wheel configuration which is also called a Ten Wheeler. This engine type replaced the 4-4-0 American type in the latter half of the 19th century in fast freight and passenger service. It was larger than the 4-4-0 and could pull a heavier load. The 4 wheel leading truck allowed good tracking at fairly high engine speeds. 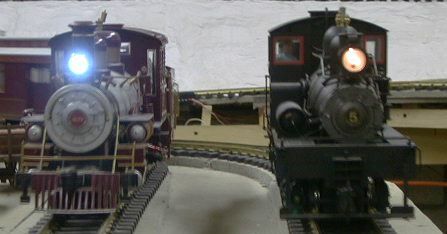 The 2-6-0 Mogul and 2-8-0 Consolidation tended to replace the 4-4-0 in freight service. 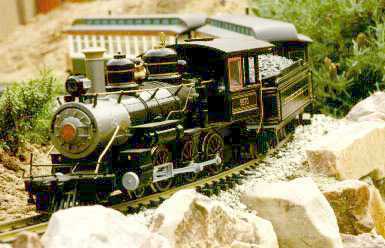 Bachmann's model is of a generic Baldwin product. The scale of the model is debatable. 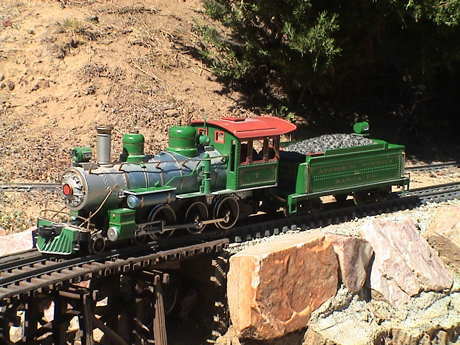 Since Ten Wheelers were built by the thousands over several decades and in various sizes, the model could represent a smaller narrow gauge loco in 1:20.3 scale, or a larger loco in 1:24 scale. 10 Wheelers of the vintage modeled didn't get big enough so that the model could reasonably represent a prototype in 1:29 or 1:32 scale. There were larger and more modern 10 wheelers made, but they don't look anything like this model. The Bachmann Big Hauler has been built in many versions over the years. I believe that the first version was the Radio Controlled Big Hauler which was produced in about 1990. This version was manufactured for many years thereafter in essentially the same form. It was never very effective as an engine, but it got many of us started in Large Scale. R/C sets could be found at toy discounters for as little as $50. 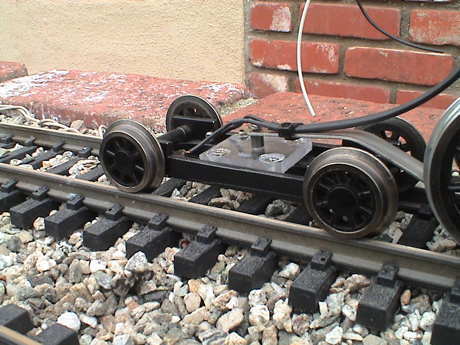 Either around the same time or a little later, track powered versions appeared. Entire sets could be found at the warehouse stores for around $100 every Christmas time. The first versions had all plastic detail, no external valve gear, very noisy internal gearing and sheet metal wiper style power pickups. The engines evolved over the years slowly gaining some external metal detail, "improved" power pickups, external valve gear, several different internal gearing arrangements, and a variety of different external details. The evolved engines were called the "Plus" series, but in fact, there were many versions of the "Plus" engines. Improvements were usually first applied to engines sold individually, but eventually these improvements made it into engines in found in sets as well. 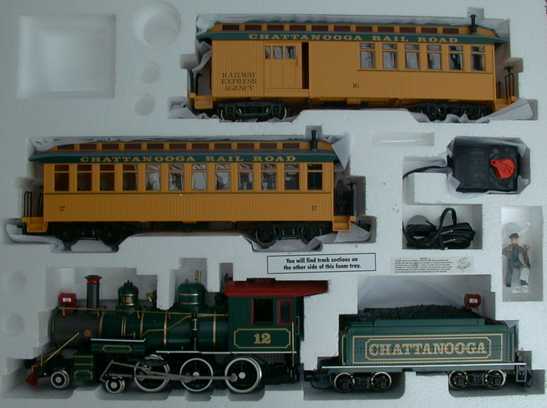 As of October 2000, a new set, the Chattanooga Railroad, appeared at Costco stores for $90. The set has a Christmas style paint job on the engine and a couple of yellow coaches. I grabbed one on impulse and I found that Bachmann has made some serious improvements over the last few years. 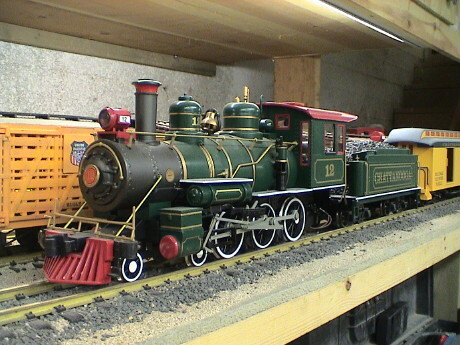 This one runs as smoothly and quietly as any large scale loco and is clearly worth the money. Don't expect that ALL of the Big Hauler traits have been fixed however, you'll still have to tweak on it a little. One of the major complaints against the Big Hauler is the fact that it tends to derail easily. The main culprit is the pilot truck. You can try these things to materially improve the tendency to derail. Make sure that the truck moves and rotates freely. The most common cause of problems is that the wires that connect the power pickups on the leading truck get pinched and prevent free movement of the truck. The symptom of this is the tendency for the front wheel on the inside of turn to lift from the track. To handle 2' radius curves, the truck must be able to move freely over the full width of the mounting slot. If the wires are pinched, loosen the screws in bottom cover next to the truck and free them. The lead truck often needs to be lubricated to slide freely. Use graphite lubricant on the sliding parts of the truck mount. Do not tighten the long screw near the pilot truck too tightly. If you do, it will deflect the bottom cover some and may bind up the movement of the lead truck. Also, the pilot truck may hang up due to an interference between the truck pivot washer and nearby screw. If a truck wheel tends to lift when entering a turn, especially in reverse, look for this problem. You may have to grind down the screw head a little to allow clearance. Check the gauge of the pilot truck wheels. If the wheels won't slop sideways 1/16" or so you'll have to regauge them. Remove the wheels on the leading truck by pulling them off. Cut the plastic axle shorter by about 1/32" and reinstall the wheels. On some locos, they are gauged too narrowly already. The symptom of too narrow a gauge is that the wheels tend to pop up at the frog of a turnout when they can't fit around the guardrails on both rails at the frog. In this case, twist and pull on them a little to create a small gap between the plastic insulator and the wheel. Weight the truck. My local Big 5 sporting goods store carries 1 oz lead weights that are shaped like a flattened oval. Use epoxy or Liquid Nails to glue 4 of these to the top of the truck. Make sure that whatever weight that you use does not interfere with the movement of the truck. Check especially for interference with the frame or the cylinder heads. Look to your track. The Big Hauler is intolerant of rapid changes in grade. If the track drops away from the pilot truck too rapidly, the truck may actually bottom out and just hang there. When this happens, it is not likely that the truck will come back down on the track. Note that added pilot truck weights may interfere with the frame on turns if your track has vertical gradients and the pilot truck spring gets depressed. Either relieve the frame above the front pilot truck axle or fix your track. If all of this fails, you can completely change out the pilot truck mount. I had one 3rd generation Big Hauler that just didn't get much run time because it derailed every time at least a dozen spots around the layout. I finally ripped out the stock truck mount and made my own from a piece of brass strip stock. Now it tracks fine and doesn't derail anywhere on the layout. The new mount is attached to the lower cover right at the front at the natural rotation point for the truck. The original coil spring is discarded and the mounting post is cut down to 3/16" high. The new mount provides the pressure that the truck needs to stay on the track without adding friction that would prevent the truck from moving and rotating to follow the track. The mount is intended to press down on the center of the truck but not to impede its movement sideways or its ability to yaw, pitch or roll. The spring has considerably more vertical movement capability than the original mount so that the truck is much more tolerant of abrupt changes in grade. The strip stock is drilled for #4 hardware and bent at the fold lines. If you make this mod, you'll have to play with the profile of the spring some, but it will work. At the truck end, the spring is attached to the truck with the original screw reinstalled loosely so that the truck can slop around a lot. The original coil spring and washers are discarded. 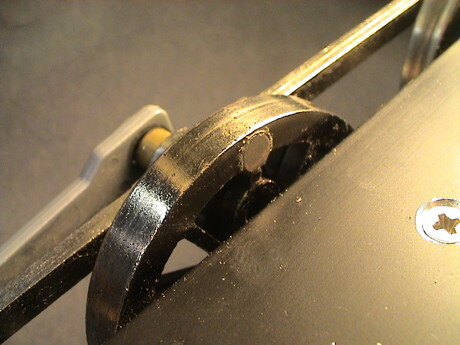 At the frame end, the spring is mounted with a #4 screw and double nuts. Doubling nutting the screw allows the spring to be drawn fairly tight against the frame but not so tight as to prevent free rotation. 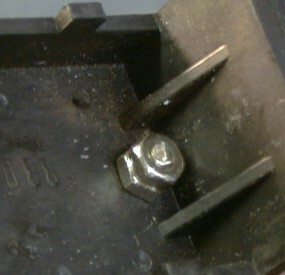 The second nut is driven against the first to lock them both in place. There is some raised lettering on the bottom of the frame that will hang on the spring. It says "Bachmann China". This lettering needs to be filed smooth. 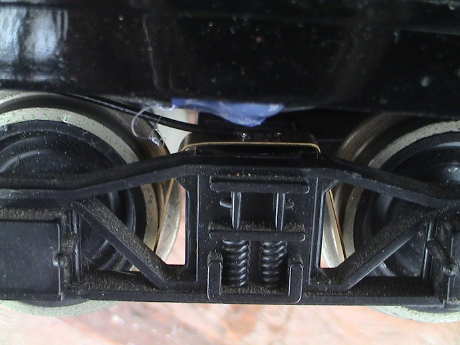 If you've used the weights as described above, you'll need to remove the rear ones. I removed all 4 and the truck still tracks properly. I extended the power wires about an inch to allow them to loop loosely so that the wires don't apply any forces to the truck at all. The wires come back out the original mounting slot. Barry Olson of Barry's Big Trains sent me an evaluation version of his replacement pilot truck for a Big Hauler. The method I described above is actually a variation of this modification, but Barry provides a whole new truck frame that is much "floppier" than the stock Bachmann truck and can follow really bad track better. I had one last unmodified Big Hauler so I ripped off the stock pilot truck and installed this one. It was pretty easy but I did make some changes. Barry recommends drilling the mounting hole for the pivot arm 7/8" back from the front of the bottom cover of the Big Hauler. I found that I had to drill the hole 1-1/8" back to get the truck centered on the cylinders. He also recommended drilling a new hole to route the wires from the truck back up into the loco. I elected to route them back up the curved slot. To do that I needed to cut the tie wrap that he provided that attaches the harness to the arm. Barry provided two new spacers for the pilot wheels. These were so tight that I didn't use them. I reused the old ones that had already been cut down in length to regauge the wheelsets. 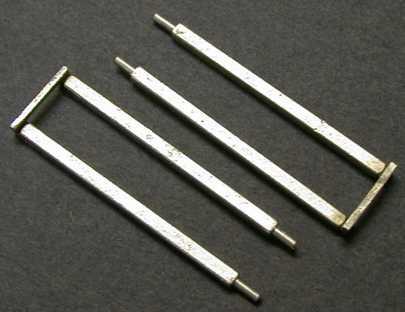 The frame members of Barry's kit are metal but they are provided with a non-conductive coating. This coating prevent current transfer from the wheels to the frames. This coating would eventually wear off in the right places, but I cleaned it out with a Dremel tool and this small wire brush. After cleaning the accumulated gunk off the wheel shanks as well, the power pickup from the truck was quite good. The result was a pilot truck that seemed to be able to ride over pretty much anything. There were ivy leaves and stems on my track when I did the initial test run. The pilot truck went right over this stuff which eventually derailed the tender several times. The pilot truck never did derail anywhere. However, the new truck is so light that it is susceptible to undergauge track or overgauge wheelsets. If the flanges don't fit between the rails properly, they will be squeezed up and derail. If this happens with properly gauged wheels, then fix the track. The Big Hauler is notorious for having flaky power pickup. The engine is supposed to pick up power on 8 wheels, but in fact the leading truck doesn't contribute much. This leaves four the drivers and they get flaky too. Bachmann has made three different types of power pickups, sheet metal wipers, spring loaded contacts and brass wheel bushings. While the brass bushings are better than the others, they develop problems too. Old Style Wiper Contacts. If your engine is an old one with strips of metal bent to make wipers, they may be completely worn out or the glue that holds them to the side of the frame has probably let go so that they have lost contact force. Either way, the best bet is to scrap them and install LGB contacts. Then add metal wheels and contacts to the tender. If the original ones aren't actually worn out, they probably still don't touch the wheels at the extremes of the axle play. On the older engines, I glue strips of styrene to the outsides of the frame right above the axle slot to limit the side play so that the contacts have a chance of making contact. I find that it takes about 0.1" of shim on each side to control the axle play. Piston Style Contacts. If your engine has spring loaded contacts, you still might want to shim the drivers as the contacts still don't reach all the time. However, a better solution is to trash the Bachmann contacts and install LGB contacts and then shim the axles. 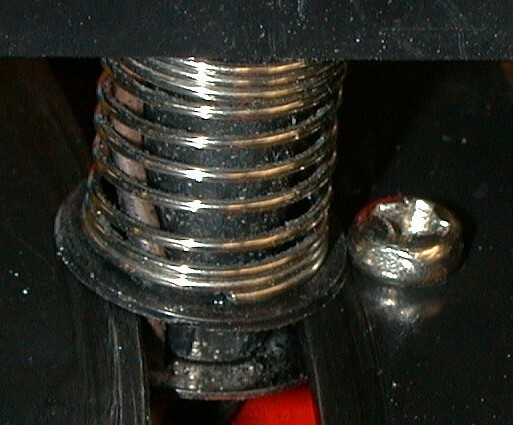 The Bachmann contacts heat under heavy load and the spring looses tension. On this engine, a spring actually melted the contact housing. 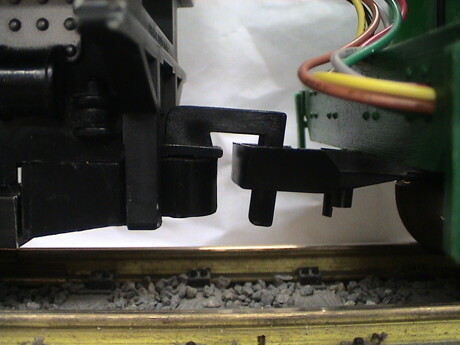 To entirely replace a contact, pull out the Bachmann contact and unsolder the wire from the back. Then solder the wire to the end of an LGB contact and then install it in the original hole with a glob of hot glue or your favorite structural adhesive. These contacts will last a long time and don't heat much when loaded. Bushing Style Contacts. 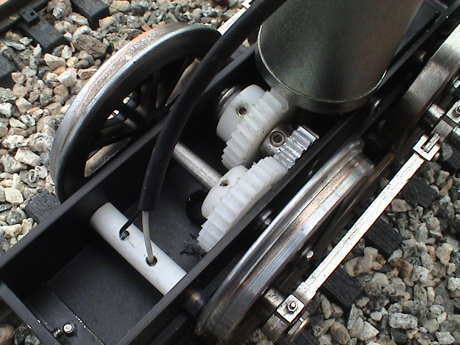 The third style of power contact uses the wheel bushings to provide a connection to the wheels. 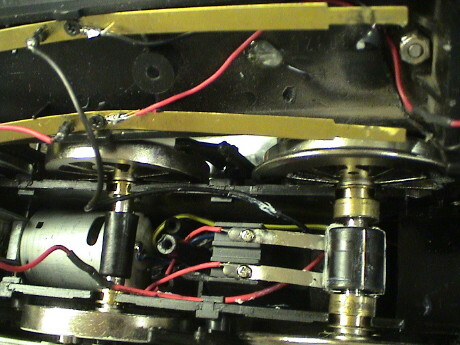 The bushings are connected to the engine with spring contact fingers mounted to the lower cover. The front truck pickups are wired to these contact springs as well. 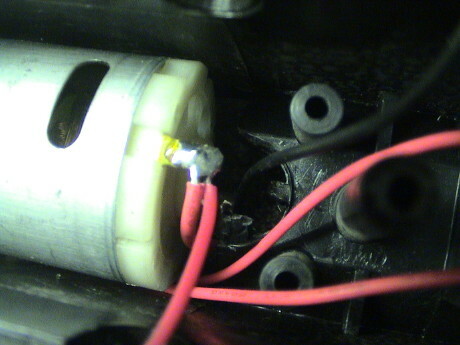 The wires to the engine body plug into the contact strips so that disconnection or reversal of the power contacts is easy. All is not well with this new system however. I noticed a pronounced sensitivity to track condition after several hours of running and a couple of disassemblies. One of the spring contacts had become cocked slightly and it rested on an insulator on the rear axle instead of the bushing. Further, the bushings seem to be flakey. There is a wheel position related hesitation on both axles when the engine is run from a Kadee wheel brush. During the hesitation, the engine makes spitting and growling sounds which may be related to motor thrashing while the resistance of the bushing is changing. The engine runs completely smoothly when the brush is used on the pilot wheels. I isolated the problem to the bushings by connecting directly to the bushing and the wheel. Other than using a conductive oil on the bushings, there doesn't seem that there is much to be done. Perhaps Bachmann will use a ball bearing on the next version as these seem to work fine on locos from other manufacturers. Tender modifications. There isn't any convenient place on the tender trucks to mount power pickups. I epoxied a 1" square piece of styrene to the bottom of the truck to make a platform where I could epoxy LGB contacts. Solder wires to the contacts before you epoxy them down as the heat of soldering will soften most epoxies. Connect the new contacts back to the engine with some sort of small connector. You might have to rummage around a local electronics or R/C car store to find something suitable or use the method described in the Power Connector Tips page. There is a cheaper way to add power pickups to a Big Hauler tender that already has metal wheels. 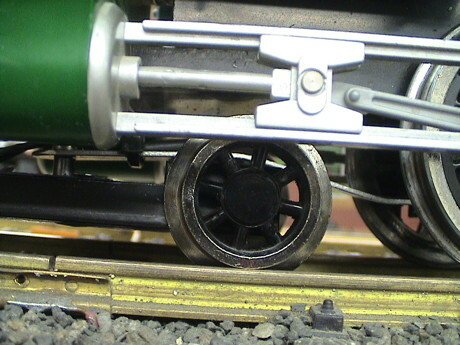 Bachmann metal wheels have two drilled pits on the backside of the wheel that make them unsuitable for piston style contacts. 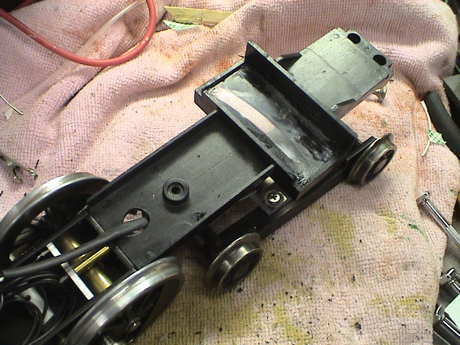 However, a simple piece of bent brass strip stock will slip over the truck and contact both wheels. It will even hold itself in place if the strip is 0.25" wide so that it captures itself between the truck frame and the wheel flange. I used 0.016" thick stock, but thinner stock will do as well. If you have it, thinner BeCu stock would work better as it has more "spring" to it and it would be easier to get adequate pressure with less drag. The downside of this cheap and dirty technique is that it adds drag, something that Big Haulers can ill afford. However, even conversion of one truck materially improves the power pickup performance. This modification is completely reversible as there are no modifications made to the structure of the tender at all. Leading Truck. There doesn't seem to be much that can be done to improve the pickup from the stock front truck except by using conductive oil on the bearings. Make sure that the wires are not broken. There is an aftermarket front truck available from Barry's Big Trains, see the section above about derailments. This truck has better power pickup than the stock truck once you clean the paint out of the axle bushings. There are at least SIX different motor/gearing systems in use in Big Haulers. 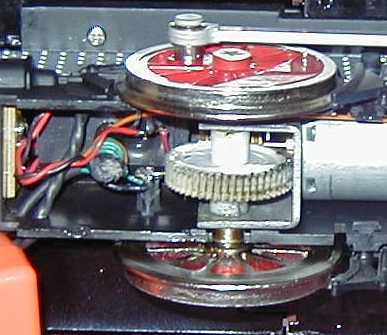 The later versions have the motor mounted in a metal bracket with the gearing. I don't have a 4th generation loco, but from reports from the field this one seems to be more robust than the earlier versions. Even so, I've still heard of the gearing getting mangled. Engines with this gearing will have a bulge on the bottom cover right between the rear drivers. This bulge clears the larger gear needed on the axle so that a reasonable reduction ratio could be achieved without intermediate gearing. The 5th generation has an intermediate reduction gear and a more substantial gearbox This version seems to be holding up well in real life service. The 6th generation is the "10th Anniversary Edition" (aka "Annie") version. I don't have one of these, but reports from the field indicate that it has the same gearing as the 5th generation drive, but with a 7 pole motor. The 7 pole motor allows it to run more smoothly at very low speed. The R/C Big Hauler uses a gearing system that is similar to the early track powered version, but it has a smaller lower voltage motor. I refer to this gearing as the 1st generation as I believe that this was the first kind of Big Hauler marketed. 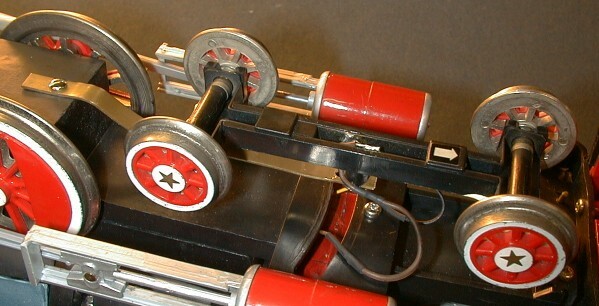 The early track powered version (2nd generation) uses the same gearing as the first generation but it has a larger motor. Due to all these gears, these make the most noise. In my limited experience the gears don't seem to strip as much as the 3rd generation type. The version has a large gear reduction ratio so that the motor runs fast (hence lots of noise) but this also reduces the load on the motor itself which tends to allow it to draw a little less current than the later versions. This engine runs fine on the puny power pack that is included in the Big Hauler sets. The later versions, especially the 3rd and 4th generations, tend to really tax the little power pack as the motors on the newer units run at higher shaft torque, lower motor speed and therefore higher motor current. 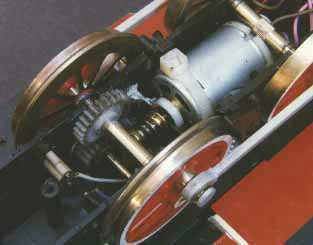 The 3rd generation version uses a brass worm on the motor and plastic reduction gears. These seem to the most prone to wiping out the gearing. 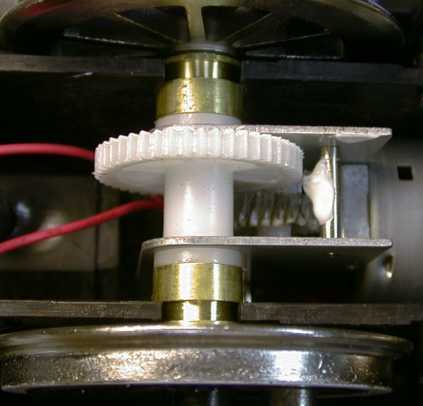 Worm gears, when placed under load, tend to thrust perpendicular to the motor shaft. If the motor is not mounted firmly (see below), this thrust tries to make the worm walk over the teeth on the meshed gear. This is evidenced by a clear popping or clicking noise, particularly when running loaded in reverse. 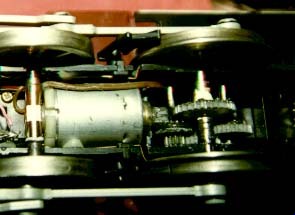 This version was produced from the early 90's to about 1997 so the majority of Big Haulers out there, including many of the "Plus" versions will have this type of gearing. I don't have a 4th generation Big Hauler, but Dan Pierce sent a photo of his. 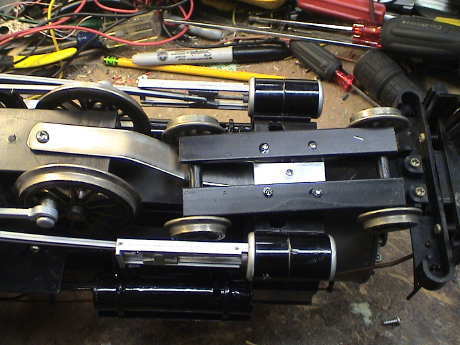 This one uses a worm on the motor and a single gear on the axle. The motor and rear axle are held in a bracket made from a piece of sheet metal bent into a U shape. The axle gear is fairly wide and centered on the axle. There is a bump on the lower cover to clear this gear. The bump is also centered. This version should have had a lower gear failure rate, but it didn't appear to work to well. There have been many reports of this configuration eating its gearing under load. The 5th version is shown in the photo. This version appeared sometime during 2000. This one has an intermediate reduction gear and a more substantial metal gearbox assembly. The axle gear is narrower and offset from the center. The bump in the lower cover is also offset from the center. There have been reports that this version has a tendency to slip. The large axle gear is apparently not attached well enough to the axle and can slip on the axle. Mine has not done this, but those with the problem have reported that if a hole is drilled in the plastic bushing next to the large gear and right through the axle and the bushing on the other side and a pin is inserted, the axle then becomes locked to the gear. The hole should be just large enough to clear the pin. A piece of steel wire would work. Then ends should be folded down to capture the wire. A common problem with Big Haulers is stripped gears. There are a variety of causes, but a major one is that the motor mount is inadequate. Other causes are heavy loads in high heat and inadequate lubrication. I can't recommend much about operation in high heat except maybe don't do it, but the other problems can be fixed. In the earlier versions, the motor is held in by two mechanisms, neither of which is adequate. Glue holds it in place, that is until the motor heats up and the glue lets go. Also the motor is pinched in saddles. Unfortunately, one of the saddles is in the bottom cover which is not very stiff. Under heavy loads, the whole bottom cover will flex in response to motor loads and the motor squirms around. For those of you that have the gearing with the brass worm and multiple reduction gears (3rd generation), you should make this modification to the motor mounts or you probably WILL strip some gears eventually. The earlier versions without the brass worm don't seem to need this modification, but it won't hurt. The 4th and 5th generations don't seem to need this modification either. Open both the top and bottom of the engine and wrap a long heavy duty cable tie around the motor and the iron weight mounted on top of the frame as shown in the photo above. Cinch that sucker down TIGHT. This holds the motor in the frame half of the saddles and materially improves problems with stripped gears. This fix applies only to 3rd generation Big Haulers, which went out of production in the late 1990's. Now that I've recommend that you cable tie the motor, you MUST make sure that you have the new motor mount ring. The new motor mount ring is a white plastic ring that wraps around the motor bearing on the worm end. This part can be clearly seen in the photo. The old type is yellowish clear plastic and is much softer. If you cable tie the motor down with an old ring, the ring will slowly deform and the worm will bear hard against the first gear. This increases the load on the motor and wears the gears and bearings out much faster. If you have an old style ring, write Bachmann and ask for a new one, they'll send it out free. 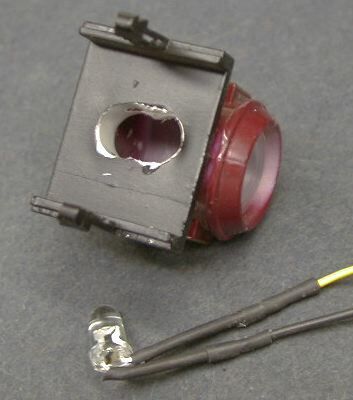 If the motor mounts are damaged, perhaps by exposure to heat, then the motor MAY sit too deeply in the mount already. If you apply the cable tie, you can then cause the worm to bind into the driven gear and either load or stall the motor. Before you cinch the tie, rotate the worm by hand to feel the "normal" amount of drag. If the drag increases after you cinch the tie, cut it out because it will cause more problems that it solves. If the drive has further problems, you may want to secure the motor with a high temperature adhesive, scrap the unit or get a BBT upgrade chassis. If you already have stripped gears but the rest of the engine is intact, send Bachmann the bad gears and they'll probably send new ones back for free. I've probably had better luck than many people with Big Hauler gears because my engines lead a sheltered life. They always stay in a cool basement which never gets warmer than 60 F. This is a far cry from sitting on the ground in Phoenix in the summer where the ground level temperatures can exceed 140 F. At these temperatures, the plastic gears will soften and be much more susceptible to being mangled. Even so, I spun the gear on the driver axle on an old Big Hauler. This happened after I added weight and could pull a heavier load. It was a simple matter to repair the gear, almost in place. I slid the gear off the knurled section of the axle and then coated the knurling with a filled epoxy. I then slid the gear back over the knurling to the proper position and allowed the epoxy to set. The epoxy grabbed on the knurling and on the ripped up plastic that had slid on the knurling and mechanically bonded the gear back on the axle. This patch has not given me any more trouble in 13 years of blatant abuse. I think that one of the basic reasons for Big Haulers stripping gears more often that other locos is that there is only one gear train to take up the load. Other locos usually have 2 or 4 gear trains so that the stresses placed on those gears are proportionally less. Add this to some heat and sloppy meshing and disaster is very likely. The Delton C-16 had only one drive gear and it has a reputation for stripping and wearing gears too. BBT's Bachmann conversion also has only one gear train, but it is an industrial strength system and doesn't seem to suffer the same difficulties. The Big Hauler was made in a R/C version. 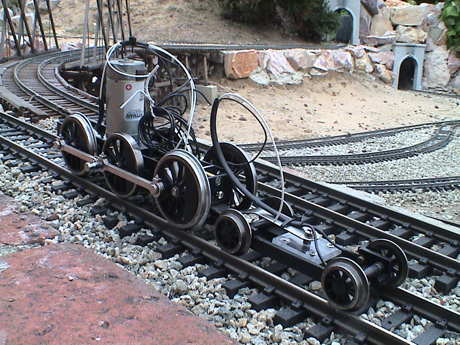 This engine looked externally identical to an early track powered version but ran from internal batteries and a rudimentary radio control system. The engine was available only in train sets. The R/C gear is a simple AM system that operates at 27 MHz although there may have been some 49 MHz systems out there as well. If the engine ran out of range of the transmitter, it would run at its default setting of full forward until it came back into range. This made backing moves difficult as the engine would try to go forward every time it lost its RF signal which would often result in severe bucking. When working properly, the motor control system is very effective. The engine can be nudged along at very low speeds and it runs steadily, that is as long as you are close enough to the engine to prevent it from running away. 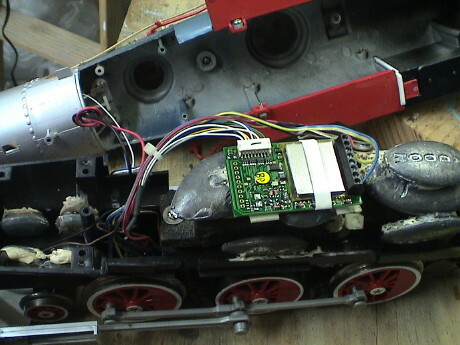 The R/C receiver is mounted on a circuit board in the smoke box and is a little difficult to get to. The antenna wire runs down the left side of the engine and loops through the cab. It has to be disconnected at a screw terminal about halfway along the left side of the boiler before the shell can be removed. The RF receiver circuits take up roughly the front 1/3 of the circuit board. The H-bridge motor controller takes up the center 1/3 of the board and the sound system takes up the rearmost 1/3 of the board. The wire leading to the tender carries the signal to the speaker. In a track powered Big Hauler, this wire carries the pulses from the sound switch. The R/C Big Hauler is designed to run from 9 volts generated by six internal D batteries. These batteries also give the engine quite a bit of weight and with the traction tires, the engine can pull fairly well on good batteries. However, the engine can also flatten the batteries fairly quickly. There is an adapter cable included to use an R/C car type sub-C rechargeable battery pack. The voltage of the sub-C pack is typically 7.2 volts so that the engine runs a little slower on the rechargeable battery than a good set of alkaline batteries. The R/C Big Hauler has another problem. 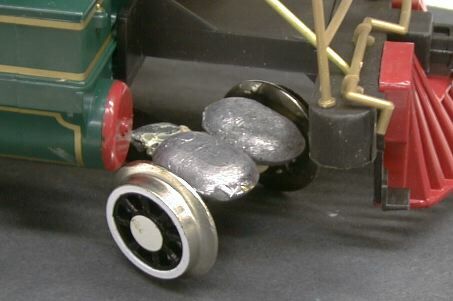 Its plastic drivers are intended to run on plastic track. After extended running on tight radius metal track, the flanges will get roughed up and eventually, they will generate so much traction against the rails in turns that the outside rear driver will literally climb the rail and derail. As much as I tried, I couldn't get the wheel resurfaced adequately so I replaced the drivers with a metal set that was made for the same vintage track powered Big Hauler. The gearing was identical so it fit right on. However, the downside is that for some reason, every time the engine ran in reverse over a turnout, some sort of radio interference was generated and the engine tended to try to reverse and buck. I never did fix this problem, we just had to stay near the engine so that the radio signal was fairly strong. We did find that by touching the transmitter antenna to the track, that the track tended to conduct the radio signal to the engine and it did run better. The R/C Big Hauler was not equipped with smoke, but I found that the smoke stacks themselves make an excellent replacement oil stack for a Bachmann Shay. The stack needs to be filed before it will fit, but once in place and airbrushed with a light coating of engine black, it matches the Shay smokebox color very well. The sound generators also transplant into a Shay well and produce a credible chuffing sound for considerably less investment than a digital sound system. Proper lubrication is critical in maintaining a Big Hauler's health. Every few months, you should follow a lubrication schedule. Remove the bottom cover as described below. Lubricate whatever gearing is in your model Big Hauler with heavy gear grease or heavy gear oil. Lubricate the motor bearings with medium or light oil. Besides being generally good practice, this helps prevent hot bearings which will melt the motor mounts. If you can get at it, lubricate the commutator (inside the motor) with a very small amount of conductive oil. There may or may not be an access port to inspect the commutator on your motor. 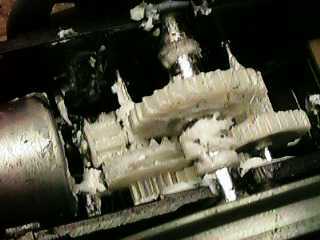 Lubricate the axle bearings with heavy gear grease or heavy gear oil. Lubricate the siderod bearings and crosshead with medium to light oil. Lubricate the pickups with a very small amount of conductive oil. Catch the bushings on the pilot truck too. Lubricate the pilot truck mount (the curved slot) with graphite. Toss it in your scrap box for parts. Convert it to a stationary boiler for your engine house. Send it back to Bachmann with $20. Under the limited lifetime warranty, they'll do what it takes to fix it. You may get a whole new bottom end but you'll still have a Bachmann Big Hauler. Send your wheels and $199.99 to Barry's Big Trains. Barry will supply a totally new and bullet proof bottom end for the engine. People that have done this rave about his work. I've been waiting for one of mine to totally bite the dust before I send it to him, but the damn things refuse to crap out. For a little extra, he'll convert it to a 2-8-0. Barry can also be reached at PO Box 1119, Tolleson, AZ 85353-1119 or at (623) 936 6088 or by Email. Barry of Barry's Big Trains sent me a set of his new laser cut stainless steel siderods for the Big Hauler. He makes these because the Bachmann siderods sometimes don't fit his mechanisms due to some rather poor tolerance control at the Bachmann factory. After looking around for an engine to install them on, I realized that none of my engines really needed them. I did test fit them on an R/C Big Hauler and found that they fit fine. I put the old rods back on because it didn't seem right to put such a nice set of hardware on an engine that hardly runs anymore. I'm going to save them for an eventual BBT chassis upgrade. Barry also sent me a set of metal crosshead guides. These are intended to replace the ones that so often break off Big Haulers. I didn't install these either but I did overlay them on a couple of Bachmann engines and it looks like they would fit well. Some Big Haulers have bumps on the stock plastic guides that cause the engine to click as it runs. These parts would fix that. Barry also makes a replacement front truck, see the section above about tracking and derailments. The Bachmann sound system can be inexpensively upgraded to sound much better. An article (Feb. 98) in Garden Railways Magazine describes the three upgrades to the stock Bachmann sound system. You can also find a draft of the article at Better Big Hauler Sound for Under a Buck. Automatic sound shutoff when the engine stops. 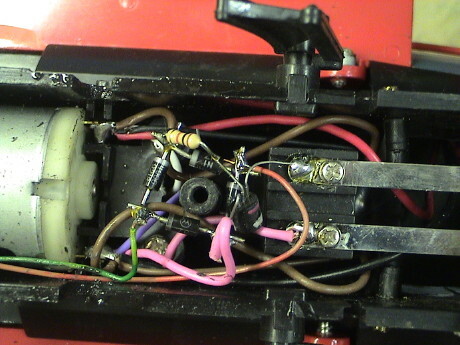 The wire between the engine and tender usually becomes very stiff with age or in the cold and the connector can tend to pull out in turns or it may even tip the engine or tender. This can cause the sound to become intermittent or stop altogether or it can cause derailments. I replace it with fine gauge speaker wire. You can get the old contacts out of the connector shell by using a fine point tool to depress the clips that hold the contacts into the shell. It is easier to do it if you cut the old wire and strip off the sleeving so that you can tug on the old wires individually. If you don't pull the contacts out of the shell, then leave a half inch or so of wire in the old shell and splice on a new flexible wire. For those of you that haven't bothered to trace it out, here is my interpretation of the schematic of the sound generator in a Big Hauler. This same circuit is included on the rear third of the circuit board in an R/C Big Hauler. As of sometime in 2000, Bachmann has changed the sound board. The new circuit can be identified from the outside of the tender as it has a volume control knob underneath the tender floor. It no longer will blow a continuous chuff when stopped, but the chuff profile is poor, it's decay is way too long. This can be fixed, see Better Big Hauler Sound for Under a Buck for more info. The new board seems to have some leakage that will flatten the battery over a period of a few months. If you are not going to use it for awhile, it might be best to turn it off with the volume control under the tender. If the smoker works, but smokes weakly, it may be possible to improve the smoke output at zero cost, see my Smoke Tips page for details. The downside is that it may go through smoke fluid faster and be even more likely to burn up if it runs dry. The Bachmann smoke system tends to burn up fairly often, so if you like smoke, you are better off replacing the smoke generator with an LGB unit, see Smoke Tips for a little more information on the smoke units. The Ten Wheeler smoke generator is similar to the one in the Shay, and the same modifications can be done. There are a couple of differences between the Big Hauler and the Shay. The Ten Wheeler smoke unit is fastened from the bottom so you have remove the shell to remove the smoke generator. Also, the stack on some units is just a little too small to accept an LGB smoke unit so you will have to drill it out. A 3/8" drill is just right, the smoke unit body will drop through and the lip on the top will hold the unit right at the top of the stack. The Shay had a conveniently placed hole in the heat sink to allow the mounting of the regulator IC, on the Big Hauler, I had to drill a mounting hole. Other than that, the modification is essentially the same as for the Shay. If your stack has a "final" on the top it may not fit properly with an LGB smoke unit installed. it can either be discarded or ground down to clear the lip of the LGB smoke unit. If your Big Hauler has a funnel stack, you'll have to figure out the mounting yourself. I don't have a funnel so I haven't worked out the details. This is the circuit that I used for the Big Hauler smoke upgrade. I wired it to improve the brightness of the headlight too. My headlight had burned out so I replaced it with a grain-of-wheat bulb (Radio Shack 272-1092c). This is a 12 volt bulb so it needed a 47 ohm resistor in series with it to drop the voltage at the bulb to about 12 volts so that it wouldn't burn up immediately. 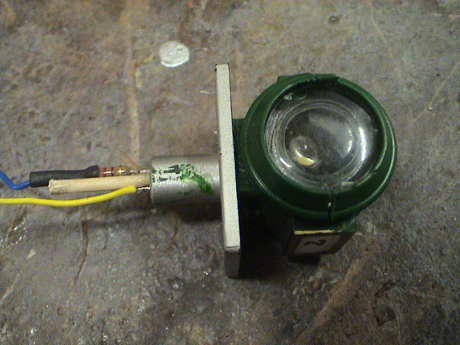 You may also need a resistor in series with the Bachmann bulb if it burns too bright. You could also use a 5 volt Grain-of-Wheat bulb and wire it at the output of the regulator. You will then have to wire the smoke switch directly in series with the smoke unit so that you can shut off the smoke without turning off the headlight. If your Big Hauler smoke unit is still working, you can just add the part of the circuit to the left of the switch and your smoke will run better at low speed with PWC. However it will also be at more risk if you should let it run dry. 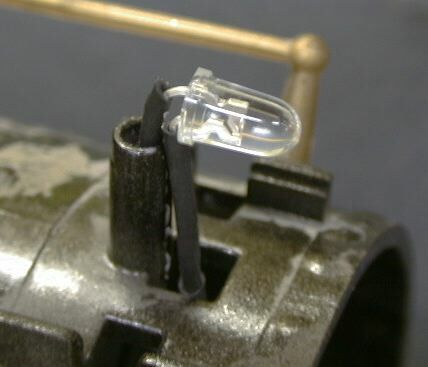 Bright white LEDs (Light Emitting Diode) are available that are much brighter than most incandescent bulbs used as large scale locomotive headlights. This section describes changing the headlight in the circuit above to an LED. The Big Hauler on the left has a Radio Shack 12v 60 mA Grain-of-Wheat bulb running at its ratings. 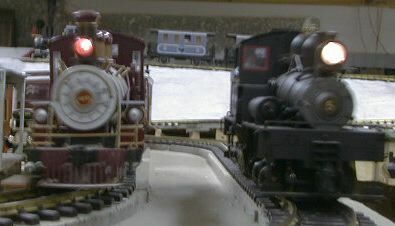 The Shay on the right has the stock Bachmann bulb that came on the early production Shays, later Shays have a much more wimpy standard yellow LED as a headlight. You can see that the Big Hauler light is not very bright as compared to the Shay. This is the modification that was made to the smoke circuit above. The LED runs off rectified track power and its current is controlled with a large series resistor that approximates a true current source. The right value for the voltage available is 600 ohm. I got the value by paralleling two 1200 ohm resistors. With Aristo PWC on th track, the LED comes on very bright before the engine even starts to move. The LED is installed in place of the original lamp, but it has to face forward to project its beam. The LED leads are insulated with shrink tube and one lead is pressed into the original support. The support had to be drilled out just a little to accommodate one lead and its shrink tube. The other lead goes into the boiler just in front of the support. A dab of hot glue holds the LED in position. The headlight housing can just be pulled off the loco. The LED wouldn't go into the housing until a little gouging was done. The original hole is drilled out to 1/4" and another 1/4" hole is drilled in front of it so that the two holes merge together. The resultant shape is then filed out to an oval. This allows the LED housing to slip up inside the headlight housing. The hard blue color of the LED can be toned down a bit by painting the LED housing with a very thin coat of Tamiya Clear Yellow paint. Keep the layer VERY thin, dry brushing or airbrushing works well. The yellow paint cuts the blue color. If you use too much the light will be distinctly yellow or even green. The Big Hauler is designed to be cheap to manufacture so its fairly easy to put together and therefore, it is easy to take apart. Prop the engine on two scraps of wood under the cab roof so that it also rests on its smokestack. This prevents the whistle and dynamo exhaust from being damaged. Pry out the pilot support rods from the sides of the smoke box. Carefully lift off the bottom cover and place it sideways in front of the cylinder saddle. Put the long screw back in the middle of the cylinder saddle so that it helps hold the saddle in place. Reassemble in the reverse order. Be very careful not to pinch the wires to the lead truck when you reinstall the cover. Also watch for the hook at the rear as it tends to flop to the side and when in that position it makes getting the cover back on difficult. Remove four screws from under the air tanks. The tanks will fall off. Carefully lift the shell off. Be careful about the wires to the smoke unit and headlight. While you're in there, glue 1 or 2 lbs of lead on top of the cast iron weight. Note that extra weight will add capability to pull more cars, which means that you can make the motor work harder, which means that the motor will run hotter. If you haven't reinforced the motor mounts, adding weight WILL result in rapid failure of the engine. Bachmann has come out with a new low cost set ($89.99 in Oct 2000 at Costco while they've got them) with a significantly upgraded locomotive. The set has the same coaches are previous sets, the same light duty track and the same wimpy power pack (but with no AC output terminals). 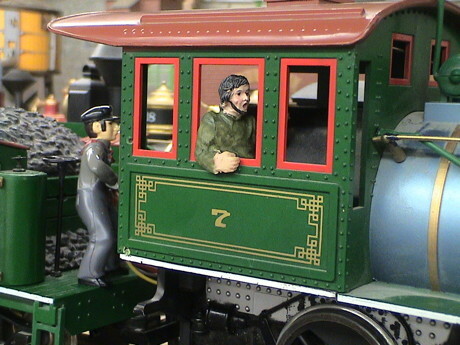 There is an engineer figure in the cab. A fireman figure, a comic book style instruction book and a VHS video are also included. All the wheels in the set are metal. The new loco pulls only marginally well, but due to the new axle bushings and improved gearing, it might be able handle increased weight for better traction. The results of some testing can be found on my Tractive Effort Tests page. The engine draws less current that most locos making it a good candidate for battery power. The locomotive detail is improved as well. All the grab irons are brass rod and there is a Walsharts type of valve gear installed. The headlight is unchanged, as is the smoke unit. The tender still has all plastic details. The sound system in the tender has been "upgraded" too. It now issues a timed chuff when it is triggered so that it will no longer stop with a chuff constantly blowing. However, the decay time of the chuff is way too long so that the chuffs tend to blend together at high speeds. This is easily fixed, see Better Bachmann Sound for About a Buck for instructions. The set comes packed with the loco, a combo coach and an observation coach (without drumhead). Both the coaches are lighted using the standard 9 volt battery. These coaches eat up expensive 9v batteries fairly quickly. Since the wheels are metal and the pickup pockets are still there, the lighting can be converted to track power fairly easily. A similar set is available at Sam's Club for $99.99. 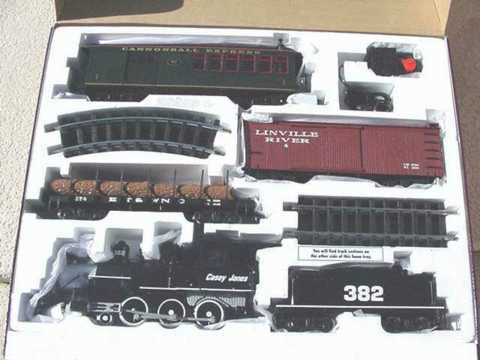 I haven't seen this set (the photo was provided by Lou Grandieri) but the Bach-man says that the set has the same new mechanism as the Chattanooga Railroad set. The engine doesn't have the external valve gear but the paint job is much better, less work will be required to convert the road name and weather the loco. I also understand that Orchard Supply Hardware has yet a third special set for a similar cost. The mechanism in this loco is all new, at least to me. The troublesome wheel contact wipers and plungers are gone, replaced with metal bushings on the axles that both pick up power and support the locomotive. These bushings are substantially heavier duty than the plastic bearings in former Big Haulers. 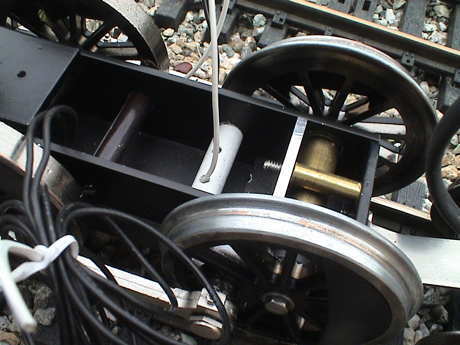 The bottom engine cover is electrically connected to the loco with two small plugs so that the entire cover can be removed and placed aside during loco maintenance. This also means that the power pickups can be disconnected easily for a battery power conversion without making any permanent modifications to the engine. The locomotive gearing is also substantially upgraded. It is now a two step reduction gear system enclosed in a metal frame. 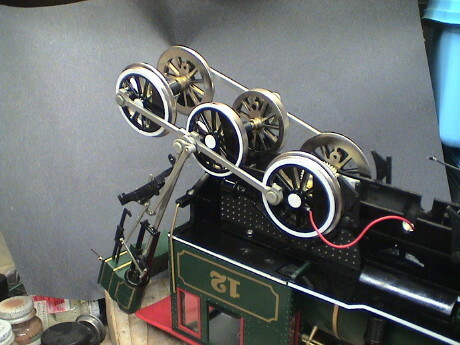 The motor is also attached to this frame so that the problems that the older locos had with gear alignment may be solved. The gear train runs nearly silently. When I had the loco open for lubrication, I checked the minimum speed. Unloaded, the drives will turn at 6 RPM at only 0.9 volts DC. This is the lowest starting voltage that I have measured so far on any loco. The mechanism would actually run as low as 0.7 volts, but it would not run consistently. This loco had an audible tick in the valve gear, once per driver turn. I tracked it down to a mold mark on the inside of the lower crossguide on one side. 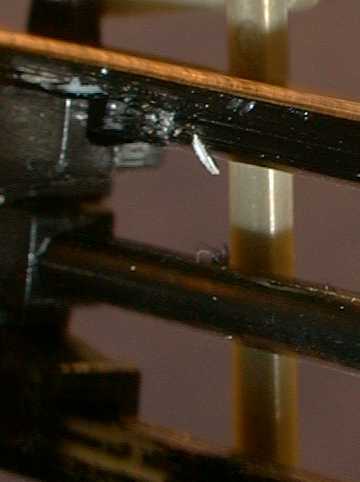 The mark is about halfway down the length of the crossguide, also about halfway between the crosshead and the little sliver of plastic in the photo. The crosshead would pop over the mark and make a click. A little careful file work removed the mold mark and the tick. I have converted the GIRR Mtn Div to operate on DCC as well as DC track power. As more locos are converted, the DC system is used less and less. My oldest loco is this ATSF Big Hauler, a 2nd generation unit. As of this writing, this loco has been running on the Mtn Div for 18 years. I didn't expect it to last this long but it has held up well so I invested $16 in a HO sized decoder for this loco. The 2nd generation units use a smaller high speed motor than the later units. The high motor speed and multiple stage gearing creates a fair amount of gear whine, but it is not overwhelming so I still run the loco. Because of the smaller motor, this loco draws the least current anything I have except the Bachmann railtruck which won't pull anything. The Big Hauler handles it's assigned 3 coach set quite nicely on the 4.2% grades of the GIRR. It struggles on the 5.2% grade of the spiral but it does it. Because of the low current draw, I could use an inexpensive HO decoder, a Digitrax DH123D which is rated at 1.5 amps, this loco only draws half that. This is what it looked like underneath before I started. The transistor and diodes are an add on kludge to stop the chuff when the track voltage goes to zero, see Better Bachmann Sound for About a Buck for the details of this hack. 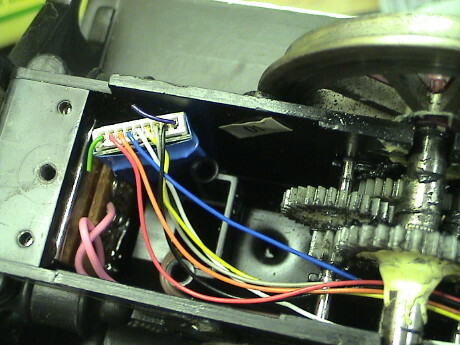 The drivers have been pulled to reveal the motor connections. The tabs from the motor are soldered directly to the brass strip that is used for the power pickups in this version. The wires leading forward from those points are for the pilot truck and the headlight/smoke unit. The brown wires lead to the back go to additional connectors that I added to allow the tender to pick up power as well and feed it forward the the engine. DCC installation requires that the motor terminals be isolated from all other wiring so I had to desolder this mess and then bend the motor leads out of the way and then attach new wires to them, properly insulated. HO decoders are convenient because they are small. This one is just stuffed into a pocket near the drawbar. The green and purple leads in the harness are not used in this decoder and don't go anywhere so I didn't insulate them. The red and black wires go to the power pickups. 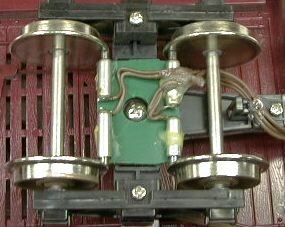 The orange and gray wires go to the motor. The blue wire is about +14 volts. The white and yellow wires are the forward and rearward headlights. I didn't use the yellow one so it is insulated and stuffed into the harness with the rest of the wires. The little sound cutoff kludge had been connected to track power, but that wouldn't work with DCC because there is track power on all the time. It was reconnected to the motor so that it could detect when the loco was moving or not. The headlight had already been converted to a white LED, but it was connected to the modified smoke circuit. I disconnected it and reconnected it from the blue wire (+) to the white wire (F0f) retaining it's 1K ohm current limiting resistor. Now the headlight is directional and can be turned off remotely. The DCC conversion on this loco went quite well. It runs more smoothly than before at low speed because the constant high track voltage makes the loco less sensitive to variable resistance in the power pickups, of which this loco has a lot. It still makes the same gear noise, but that should not have changed. It still pulls it's assigned consist the same as before. The maximum speed is a little higher than needed, even at only 16 volts on the track. I'll wait to see how all of the locos perform at the top end and if they all end up with too much speed, I'll reduce the track voltage until the slowest one is fast enough. Then I'll change the decoder parameters of each loco to set it's individual maximum speed to just what I want. 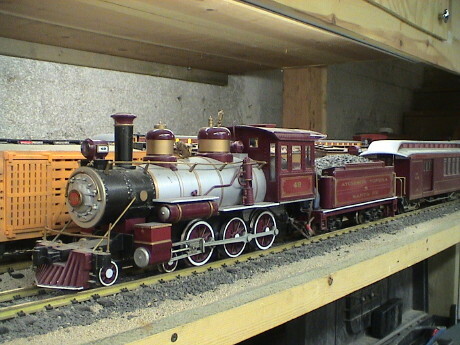 The next one that was in line for a DCC conversion was a 3rd generation Big Hauler, an Emmett Kelly circus engine. This one has been has been seen before in several places on this page. A 3rd generation Big Hauler has less gear reduction than the 2nd generation unit. It makes less noise, but it also needs more motor torque, and therefore draws motor current. The running current is about 1.5 amps which is the limit for the DH123. The stall current is nearly 5 amps, way beyond the DH123's capability. I elected to install a DG583S decoder which is plenty of capacity for this engine. The downside of the DG583S is that it is bigger and considerably more expensive, about $54. This installation required access from both the top and the bottom which made it somewhat more complicated. The loco used a different method of power pickup so that there isn't a brass strip running along the side. There are piston contacts and the first and third driver sets. The motor tabs are used as binding posts to bring together the wires from the pickups (2 per side) the wire to the smoke box (1 per side) and a wire to the pilot truck (1 per side). I also noticed that the bearing support ring for this end of the motor was missing. I found it stuck in a wad of grease inside the loco. Apparently, I had dropped it while I was putting in the motor the last time I was in there. 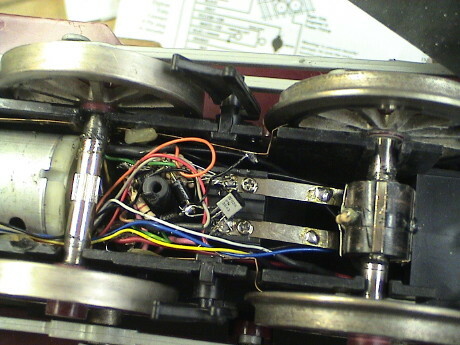 I removed all four wires from one motor tab and soldered them together (with the lead from the rear contacts extended to make some working room) with yet another wire that was directed upwards in the loco body to provide power to the decoder. I then did the same thing on the other side. I then cut the tie wrap that was holding the motor in place and removed the motor. It was easier to solder new wires on the motor tabs with the motor out of the loco but the main reason for removing the motor was to reinstall the bearing support ring. I also soldered the wires to the sound system cutoff kludge and then insulated the motor tabs. The new motor wires were also directed upwards into the boiler. 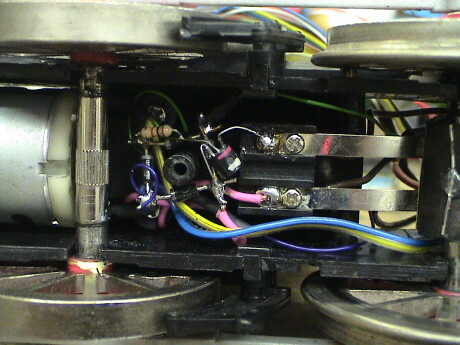 The blue/yellow pair is the motor connection. Not visible in this photo, there is also a red/black pair for track power. 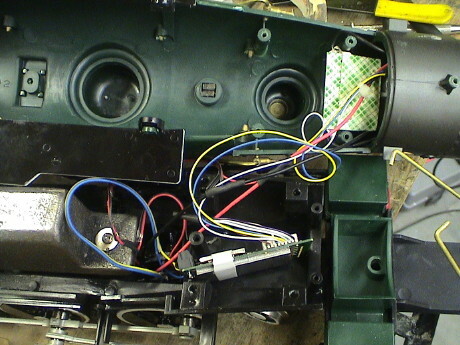 The darker blue and green wires are the extensions of the wires from the rear pickups. All of the track power wires are joined up behind the sound system contacts and insulated with shrink tube. Removal of a bunch of wires made the area next to the motor much less congested. The decoder is mounted on top of some lead fishing weights. I had to pull off three 2 oz. weights to make room for the decoder so that it would not interfere with the inside of the boiler. Two of the missing weights were attached along the sides of the stack and one was reattached behind the decoder. The only function wires that I used were for the headlight, the blue wire for power and the white wire for the F0f function. As with every installation of the DG583S that I have done so far, the front headlight came on only in reverse according to the icon on the throttle. I set CV29=7 to reverse the normal direction of travel (NDOT) and then swapped the motor wires so that the loco ran forward when the headlight was on and the throttle said that the loco should be running forward. 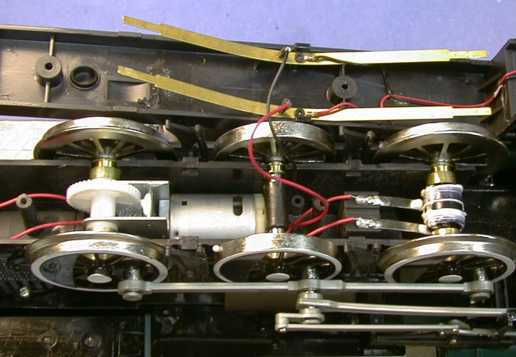 After reassembly of the loco, it ran fine with no obvious performance difference except that the low speed stability of the loco was significantly improved due to the BEMF capability of this decoder. The 3rd generation DCC installation went ok so I decided to attack the 5th generation Big Hauler next. This one has had the least modification of any of them but it still has sound updates and a remounted pilot truck. Power pickup has also been jumpered from the tender to the loco. This one doesn't draw quite as much current that the 3rd generation unit, but still too much for an HO sized decoder so I put another DG583S in this one. The motor mount and gearing are quite different in this loco. The motor assembly does not come out easily. It looks like there is a pin that holds the assembly in place. It didn't budge with some moderate tapping so I elected to rewire the motor in place. 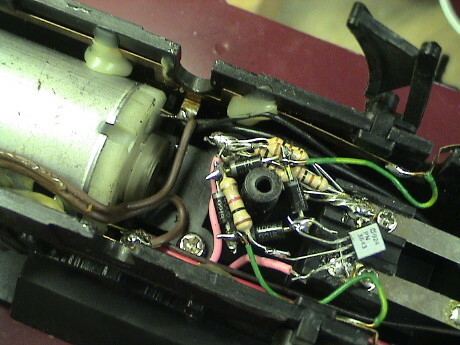 The motor tabs were used for a binding post, but there are only two wires soldered to each tab. 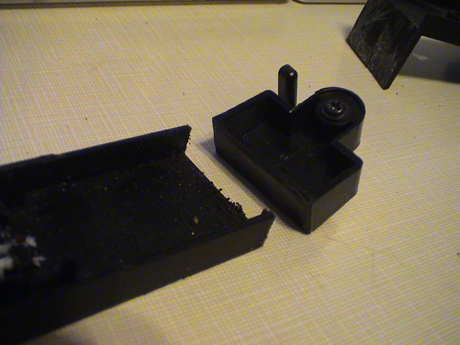 One wire comes from the bottom cover assembly, the other goes forward to the switch on the smokebox door. I unsoldered the wires on the top tab to get them out of the way and then I unsoldered the wires on the bottom tab. The wires going forward can be pulled off the tabs with a pair of thin needle nose pliers pulling on the wires as they transit the area under the sound switch contact strips. I spliced the wires back together and insulated them with shrink tube and pushed the excess up into the boiler. The motor wires were soldered back on the motor tabs and then the other end of those wires were pushed back up into the boiler. I reassembled the bottom of the loco and buttoned it up. The installation on the topside was pretty easy with only one difficulty. Nothing would stick to the cast iron weight so I could not mount the decoder up there. Even after being cleaned with alcohol, brushed with a wire wheel and then filed down to bare metal, my foam tape, hot glue or quick grab glue would not adhere to the cast iron. I punted and dropped the decoder into a cavity in the frame at the front. I insulated the connections on the smoke unit because they would come close to the edge of the decoder. In the previous installation using the DG583S, I had difficulties with the headlight not working in the right direction. On a hunch, this time I wired the front headlight the F0r, the yellow wire for the rear headlight. Then it worked properly. Further the yellow wire responds to CV49 which sets up special effects for the FRONT headlight which is supposed to be on the white wire. Something is wrong in either the decoder firmware or the cable harness and instructions that define the front and rear headlight function wires. I finally got around to converting a 3rd generation Pennsy Big Hauler to DCC. This one has had most of the standard modifications already, 4 chuffs/turn, chuff stop, sound board mods and a weighted front truck. I purchased some MRC AD322 decoders on closeout at $11 each and I had two left and nowhere for them to go so I stuffed one in the Big Hauler. It was a pretty standard installation with only the motor and the headlight connected to the decoder. Except for the physical mounting of the decoder, I used much the same method as the Emmett Kelly Big Hauler. The decoder is pretty large but I found a place for it in front of the cast iron weight. The board is held down with two globs of hot glue at the front. The heat sink of the regular IC rests on a piece of a coffee stirrer that is stuck to the weight with double back foam tape. This IC gets pretty hot in operation so I couldn't just rest it on the tape or it would have melted right through. Just for safety, I also laid a piece of tape across the terminals of the smoke unit to act as an insulator although the decoder board doesn't get very close to it. There was one change I had to make due to an issue with the AD322. This decoder has a much lower switching frequency than the decoders I used in the other Big Haulers. Some of this motor noise coupled through the chuff stop circuit and got onto the chuff sound as an audible buzz. I added a resistor and a capacitor to filter out this noise. The 100 ohm resistor limits the peak currents that can charge the capacitor, this is to make the circuit more friendly to a DCC decoder. The filter capacitor charges up to the peak motor voltage at the first motor pulse to activate the circuit as well as filtering off the PWM noise delivered to the motor by the DCC decoder. I had a motor failure of a 3rd generation Big Hauler (the Pennsy one) and I didn't want to send it to Bachmann because it had been extensively modified and Bachmann would probably replace it outright. I would loose my upgrades. So instead, I asked Barry of Barry's Big Trains if he had any motors. He did and sold me one for $5 plus shipping. I used that motor to fix the Big Hauler. Then Barry kept asking me if I had an "Annie" version and I said that I didn't. I was far too dense to realize that he wanted to send me a whole upgrade for evaluation and review. He sent it to me anyway. Then I had one of his famous upgrades and no broken locos to install it into. What to do? I am a firm believer in the "if the damn thing works at all, don't mess with it" philosophy. I mess with stuff if it doesn't work right. If it's running to my satisfaction, I leave it alone. All four of my track powered Big Haulers were in that camp (the Pennsy had just been fixed). This is the chassis that Barry sent. 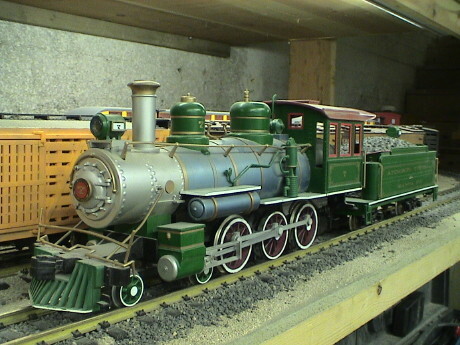 This is a chassis intended for the Bachmann "Annie." It is a MAJOR upgrade from ANY production Big Hauler. It has a REAL motor (a Pittman), heavy duty gears, piston type power pickups, a magnetic chuff sensor and a rocking front driver. The rocking driver provides a true 3 point suspension and improves tracking significantly. It also has his replacement front truck with power pickups. Barry says that the whole thing (less motor) is warranted for HIS lifetime. Barry also makes upgrades for conversion of a Big Hauler to a 2-8-0 and he is working on kits for upgrading the Lionel Atlantic, the Bachmann K-27 and the Bachmann Connie. He sent me this thing and I feel that I owe him a report for his effort. So which working Big Hauler do I rip apart? This is my very first large scale loco, a 2nd generation Big Hauler. I got it at Christmas in 1990 as part of a Costco set. This is the train that sunk my future by getting me into large scale trains in the first place. It whines a bit when it runs, but it has been running with few serious problems for 20 years. I expect that it will go much longer. Even with the noise, I still like it a lot, it runs very well and I didn't want to mess with success. This 3rd generation Big Hauler came a year or so later, also in a Costco set. It gave me quite a bit of trouble, but eventually I got it running properly. It doesn't get much run time but it runs and I elected not to tear into it either. This one actually belongs to my son, Charlie. He got it from Christmas in the late 90's sometime. This is the one that recently ate it's motor after some extended running. It's been fixed so I didn't want to tear into it either. 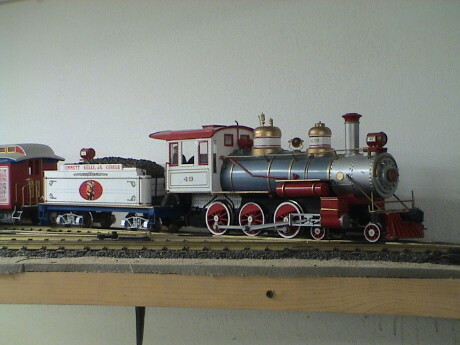 The Chattanooga Choo Choo arrived, also in a Costco Christmas set, in about 2000. It is a 5th generation unit and has run quite well from the beginning. I didn't want to tear into this one either. Then there is this one. This is 1st generation RC Big Hauler that belongs to my oldest son, Richard. He also got it for Christmas in 1990 when he was just seven years old. The sets were being sold for $50 at the time at Toys-R-Us. This set proved less frustrating than an HO train set he got from his grandfather the year before (the HO stuff still lives, see the GIRR HO page). The engine actually still sort of runs and the transmitter that goes with it also still works. However, the engine doesn't run very well. 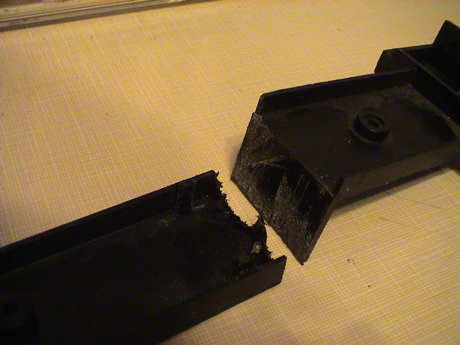 After running on metal track for several years, the plastic driver flanges roughed up and the thing would climb the rails and derail. I replaced the plastic drivers with metal ones and it didn't derail, but there was some kind of problem with the radio link. The engine would stop and try to back up when running over turnouts. I never did figure out how to fix that except to keep the transmitter within a few feet of the loco so it just sat in the engine yard for 15 years or so. I also have most of the bits and pieces of two other RC Big Haulers (one green like that one and one circus engine). This is what I needed, a nearly useless loco. I also like the paint job and it is lettered for ATSF. If I could fit Barry's upgraded chassis under this loco, it would probably fit anywhere. The loco has the typical Bachmann chuff only sound system (on a board in the smokebox) which will get ripped out and reinstalled in the tender. The tender has metal wheels too so I can add power pickups to the tender if necessary. I have one spare DG583S DCC decoder in stock which should run Barry's chassis just fine. I don't have the room for another running Big Hauler at the GIRR Mountain Division so I'm going to move this one to the GIRR where it will run outside, sometimes in some heat. Barry's chassis will be more suitable there than in the sheltered and cool environment of the Mountain Division. This is the gear train of the BBT chassis. Barry normally uses the drivers from the target conversion loco, trues them and them mounts them to a new axle, properly quartered. This kit came with wheels. The Pittman motor draws about 300 mA running free on the bench and 8 amps at a hard stall at 20 volts. 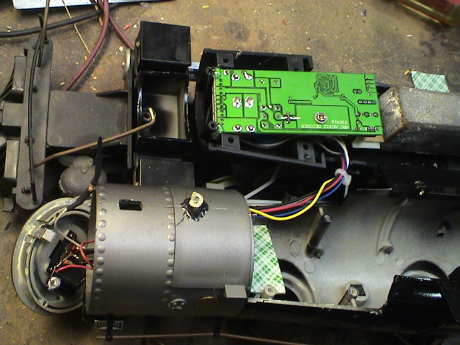 The motor is wired to the power pickups on the loco as delivered so it will run by itself. The white cylinder is a pair of piston contacts for the front driver. The black cylinder behind it is the reed switch for the chuff. There are four magnets imbedded in the wheel, one is just barely visible above the chassis. The black wires in the foreground are the wires to the reed switch. The assembly at the front is the rocking axle bushing. On the chassis he sent me, the pilot truck is already mounted. It has it's own power pickups but they need to be wired in. Barry provides extensive instructions for how to cut down a track powered or RC Big Hauler to integrate with his chassis. Some trimming needs to be done to reattach the hook for the tender and for the stock Bachmann pilot truck if Barry's truck isn't used. The work isn't hard, but the instructions need to be followed closely. The first thing that I did was run the chassis on the track on DC and it ran fine. The track was horribly dirty as it had not been cleaned in more than a month as I had been traveling and the trains hadn't been running. With only 4 wheels picking up power, it sputtered a little, but it wasn't bad. Then I cleaned a section and it didn't sputter at all on that section. I then wired the pilot truck in and did a test install of a DCC decoder, a DG583S. This worked out fine and the loco ran well even on the dirty track. Then I sat down with the instructions trying to figure out what I am going to have to do to hack up the Big Hauler. The basket case shell that I have is too much of a basket case to actually use, many of the detail parts are missing from the shell. Unless I find some serious issue, I am going to cut up the "frame" part of a basket case unit and then mount the good shell to that assembly. Barry included a piece of clear plastic with the kit. A handwritten note indicated that it was a stiffener for the area that had the old pilot truck. The curved slot is so long that it weakens the whole assembly. The new piece is supposed to fit in there and be securely glued down so that the impact of the slot is negated. The lower cover is hacked into three pieces per the drawings that came with the upgrade kit. In this photo, the forward part of the lower cover is cut off. It will be screwed back to the front of the BBT chassis. Similarly, the rear extension is cut off the lower cover and bolted to the rear of the BBT chassis. Eventually, when the chassis assembly is hacked and fitted into place, two screws will go through these extensions and mate to the Bachmann chassis to secure the BBT chassis to the Bachmann chassis. There was one hang up with the stiffener piece that Barry supplied. It blocks the curved slot so that it is no longer easy to route the power pickup wires from the pilot truck back into the loco. I drilled a 3/8" hole in the Bachmann pilot part to clear the wire. The chassis piece is severely cut down per the BBT instructions. 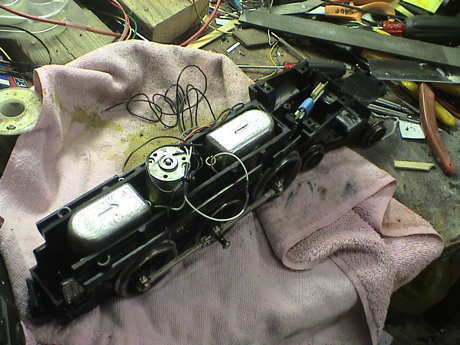 The lower parts are removed to clear the axles and pickups. 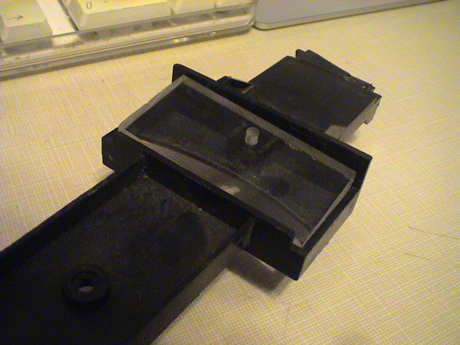 I used and RC Big Hauler chassis so that sides of the battery compartment are cut down. Then a big hole is cut through the bottom of the piece to clear the motor. This piece then fits over the motor and onto the BBT chassis. Two screws coming up from the bottom hold the whole thing together. Apparently, there are two flavors of chassis in the RC Big Hauler. The one I cut up didn't have the bosses for the brake shoes. The other two did. Therefore, I didn't use the brake shoes. The hacking on the chassis assembly is what took the longest amount of time. I used a Dremel tool with a cutoff wheel to make the side cuts. I used a razor saw for part of it but my arm was getting tired. The Dremel was a bit slower, but less work. For the cutout to clear the motor I used the Dremel with a small milling bit and just gouged it out. Barry recommends added 4 to 5 lbs of weight to the loco. I elected to add 2 lbs of fishing weights inside the chassis assembly. If it isn't enough, I have two more weights that I can stack on top of those. They are held in with fillets of hot glue (applied after the photo was taken). The Digitrax DG583S DCC decoder has been placed in the chassis right under where the air tanks will be. There is plenty of room for it and all the wiring is easy to get to. I am going to use a 6 conductor harness and connector to connect to the tender. Two wires will be reserved for power pickups on the tender if I need them. 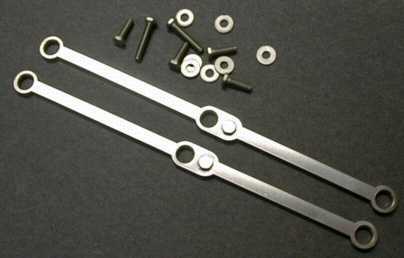 Two will be used by the chuff trigger that BBT provides. The other two are for the rear headlight which Big Haulers do not typically have, but I am going to wire an LED into each of the existing housings. At this point, I haven't touched the loco that will surrender it's shell and sound board to this conversion. I have wired the 6 conductor cable to the loco. For my own records, this is the pinout. The old RC Big Hauler surrendered it's shell, steam chest, pilot, and drive rods to the conversion. It actually had a headlight, a 9 volt 55 mA bulb, so I used it with a 200 ohm series dropping resistor. If it eventually isn't bright enough or fails, I'll wire in an LED. The final assembly went smooth enough, the shell mounts the same way that it used to. I did patch up some broken detail with gel CA and it's still missing it's bell although the bell harp is still there, but the loco part is done. The black wheels don't look too bad under the green loco. If it bothers me, I can paint them later. As indicated in the BBT instructions, I had to add some spacers between the connecting rods and drive rods. 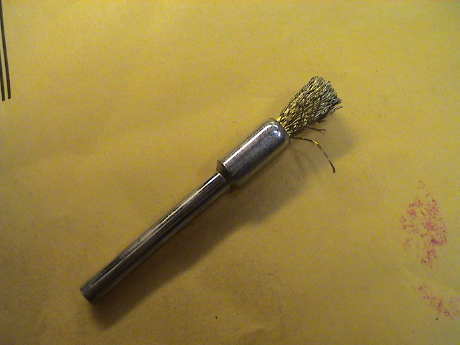 The crankpin on the center drivers are pretty long so that the drive rods can clear the crankpin on the front driver. I added a 0.225" long piece of 0.25" OD brass tube to each side as a spacer so that the drive rods are positioned parallel to the track. Next, the tender. The RC Big Hauler's sound board is part of the RC control board that is still attached to the old frame. There are instructions on how to reuse it as a stand alone analog sound generator earlier at my Better Bachmann Sound for Under a Buck page. 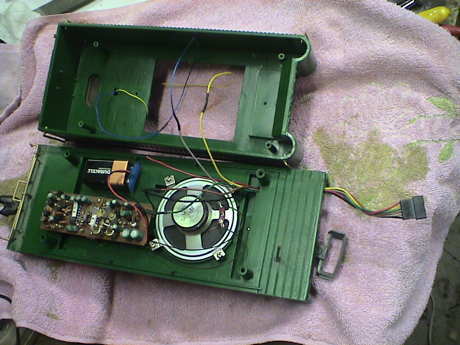 I'll reuse the speaker that is already in the tender and wire in a 9 volt battery to power the board. It'll use a battery clip as the stuff that is usually in a Big Hauler tender to deal with the battery isn't there in the RC version. The tender has San-Val metal wheels and I have included track pickup wires in the 6 conductor harness but I won't add pickups to the tender until I determine that they are necessary. The rear headlight assembly never had anything in it. I elected to install an LED. The headlight is cast with a horizontal split line. To gain access, the top half needs to be pried off to break some glue joints. I drilled up through the screw hole in the bottom for wire access. It sticks well enough in it's mount that it doesn't really need the screw. The 5 mm warm white LED leads were formed to allow the LED to face out of the lens. The leads were separated with a toothpick rammed up the access hole. This also allowed me to adjust the position of the LED after I had reassembled the headlight and it insulated the LED leads. An 820Ω resistor is used to current limit the LED at 20 mA when run from a DCC track voltage of 22 VRMS. The whole RC Big Hauler receiver/motor controller/sound board has been remounted in the tender. Two traces have been cut so that only the sound section is powered. I am using the stock speaker. The tender had an LGB knuckle coupler on it as it came from the GIRR Mtn Div. I removed it and installed a Kadee #831. I did a test run this afternoon. It went pretty well but there are some issues. 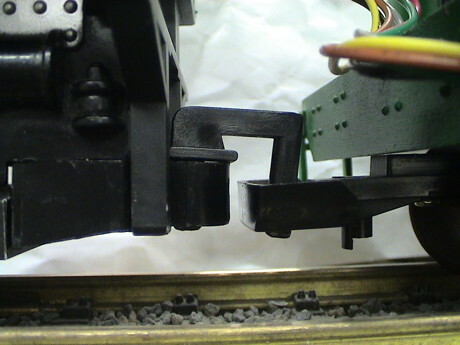 First, the BBT sound trigger switch shorted closed after the loco had run for about 20'. I'll need to take the loco back apart to access it. Second, I forgot to add my chuff cutoff circuit. Third, it is clear that the loco doesn't have enough weight. It has way more power than it has traction. Barry's recommendation of 4 to 5 lbs is probably closer to correct. While I have it open, I'll add some more. Fourth, the wimpy incandescent headlight has to go. The LED rear headlight is so much brighter that I'll need to do somewhat the same modification to it too. However, it ran and tracked well. I did get some derailments, but only because the loco was continually running over dried ivy leaves, stems and twigs. When those were finally swept off the track, it didn't have any more problems. The track was really dirty and the loco was hesitating a bit but after I dragged and Aristo track cleaning car around a few times, that went away too. I tested the sound trigger switch this morning and it was still stuck. 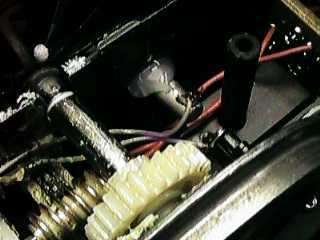 A simple tap with a screwdriver on the chassis was enough to shock the trigger and cause it to open again. It is pretty clear that the current drawn by the sound system was welding the contacts. The sound system current is pretty low, about 60 mA, but there might be a spike that is higher. The 47µF capacitor that I sometimes install on these things isn't there on this one. I installed a 47Ω resistor in series with the sound system trigger input to provide a little current limiting and gave it a few minutes test on the bench. The problem appears to be gone. I installed one of the chuff stopper circuits that is described earlier in this page. It is soldered onto the motor leads so that it detects when the DCC decoder has stopped the loco. Another 1 lb weight is attached on top of the one in the rear. At the front, the existing weight was offset a little behind the first driver so I attached another 1 lb weight forward of the driver in an attempt to get the sum of the weights balanced above the first driver. 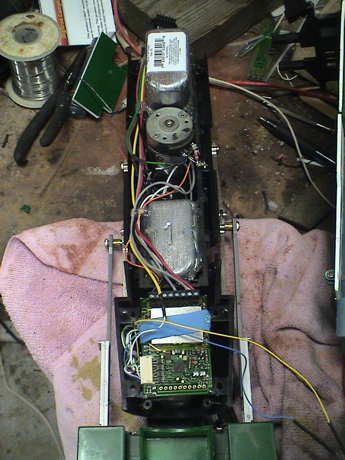 It is mounted where the DCC decoder used to be, below the DCC decoder in the photo. Eventually, I moved the decoder to mount with foam tape on top of the original forward weight. The decoder was just a little too wide to allow the loco to be reassembled easily. The headlight was modified to be an LED just like the rear one. It is mounted as described above in this page. It also uses an 820Ω current limiting resistor so that it draws 20 mA. Unless I run into further difficulties, I think that the BBT upgrade installation is complete. I ran my more or less standard Tractive Effort Tests and it came out about right. On my ruling grade, it pulls 12 heavy cars with just a little slipping. Running light, it draws 600 mA. Either pulling the 12 cars or restrained so that it is slipping, it pulls 1.4 amps. This with DC on the track. I added power pickups to the tender lead truck using the brass strip method described in the power pickup section of this page. I also added a sound power switch since I was in there already. It probably doesn't need it, the Bachmann boards draw very little current when idle but I put it in anyway. I took the BBT upgraded Big Hauler to the GIRR Mtn Div for testing on tight radius (4' diameter, R1) track. I expected it to do well, it didn't. It derailed on the first turn. The pilot truck went first and took the rest of the loco with it. Unfortunately, I didn't get a photo of the truck in it's original state. The problem is that it was mounted too far to the rear and the front wheel was hanging up on the cylinder head in the tight curves. This lifted the rear axle of the pilot truck off the track and it derailed immediately. After inspecting the assembly, I found two problems. First, the swing arm wasn't quite long enough so that the truck was too far rearward by about 1/4". The truck should be centered on the cylinder assembly like the photo. Also, the plastic insulator in the center was not flopping around like it was supposed to. I removed the truck from the mounting bracket and then removed the plastic insulator. The countersunk holes were not drilled in exactly the right spot and where the hole was narrowest at the bottom, the plastic insulator was hanging up on the screw threads. A quick file job to open the holes a little fixed that. Then I drilled and tapped a new #4-40 pivot hole for the truck 1/4" behind the original one and remounted the truck in the new hole. This improved the derailment problem but didn't entirely fix it. Now I could see that the rear axle was not turning while in tight curves. There were two causes for that. First, one of the wheelsets on the rear axle appeared to have some glue or something on the axle where it rotated inside the truck. This was hanging it up. Some file work took that off and it got better but it was still not well and the truck still tended to derail at the rear axle. The way that the pilot truck bracket was bent, it was applying a rotational force that pitched the truck upward to the rear. This tended to lift the rear axle off the track a little and it didn't get enough friction to turn. I rebent the bracket such that it was closer to parallel with respect to the track, as shown in the photo, instead of canted downward to the front. Both bends were too tight and needed adjustment. THEN both axles would turn and the pilot truck did not derail. The loco did have some difficulties on the tight radius LGB and Aristo turnouts, it tended to bump over the frogs. This is because the driver flanges are a little smaller than the stock flanges. This was probably done to make it look better. However, in flange bearing frogs, the wheel tends to drop a little in the frogs. Just don't take the low speed turnouts at high speed and it'll do better. The original Big Hauler driver flanges are almost the same size as the ones on the pilot wheels. After Barry's modifications, I think that they are a little smaller. Something I had never noticed before was that the hook for the tender seemed to be a little high. I knew that that would be a problem at one spot on the GIRR Mtn Div where there is an abrupt vertical gradient (it's been there since day 1 and would be hard to fix). The front of the engine will dip downward when it was on the grade and the tender was still on the flat. The hook moved upward and the tender would either disconnect or almost disconnect. I could not determine if the loco was actually higher than it used to be but I suspect that this is the case. In any event, I could either try to remount the hook part lower or adjust the loop. It was easiest just to put a hot air gun on the tender truck coupler tang for about 10 seconds and to form it upward until the loop almost touched the tender frame. This resulted in plenty of engagement and the problem was solved. I am still having some difficulty with the chuff switch. The black cylinder is the reed switch for the chuff. Some days it works properly, some days it doesn't. On the bad days, the sound system will chuff only three or even two beats per turn. 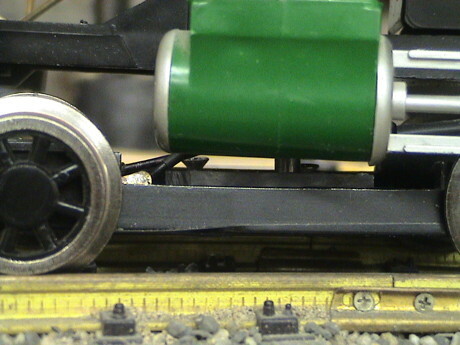 BBT has mounted the chuff switch crossways to the chassis so the magnets embedded in the left center driver are lined up with the end of the reed switch. The switch is least sensitive in this position and probably needs to be remounted. To do that, I'll have to remove the shell and peel out the weight behind the front driver axle so that I can get to the switch. The switch probably should be mounted against the chassis wall, near the top of the frame, so that the center of the switch is nearest the arc of the magnets and that the path of the magnets is nearly perpendicular to the switch. There is marginally enough room to mount the switch on the outside of the frame, on the bottom. However, this is not a good plan. When the magnet movement is parallel to the switch axis, it may bounce and make two beats where there should be only one. Mounting the switch inside above the existing switch, the magnet path will be nearly perpendicular to the switch body. However, then the switch would be further away from the magnets and there is no assurance that the change would work better. Another possible option is to remove the driver with the embedded magnets and see if I can find some stronger magnets that would fit in the holes that BBT drilled. There isn't room between the existing magnets and the frame to place a small magnet on the end of the existing ones. There MIGHT be room to shim the existing magnets outward just a little. This might be easier than remounting the reed switch. However all this seems like a lot of work. When only one chuff isn't working, then that magnet is probably further from the switch. I identified which magnet it was relative to the crankpin and looked at it's position relative to the other magnets. It was the one that had the least extension from the wheel so it was furthest from the switch. I then decided to try slightly moving the switch. The switch is mounted in a hole in the left side of the frame and protrudes somewhat. The other end is restrained by it's leads which are fed out a slot to the outside and then right back in another adjacent slot. I found that by inserting a small screwdriver under the wires that were outside the frame on the engineer's side, I could pull a little wire back out the 2nd slot. Then I could use the same screwdriver to push the switch to the fireman's side by pressing gently into the 1st slot. This pushed the switch outward toward the wheel with the magnets. Then the magnet that stuck out the furthest would hang on the switch. The solution there was to file the high spot and smooth out the edges of the magnets and the glue that was holding them in place so that all of them were flush or nearly flush to the wheel. Then I could push the switch out to where is almost touched the one that was still a small lump on the wheel. Using a toothpick, I placed a drop of gap filling CA to bridge the gap between the switch housing and the frame. There is only a little bit there. I want to be able to break that joint later if necessary and even a small amount of CA will hold the switch in position. Now there is a minimal gap between all four magnets and the switch and it chuffs four times per turn. The bearings that BBT uses hold the wheel very tightly in position so that movement of the wheel itself is very small. In any event, with the magnets flush to the wheel, there is nothing for the switch to hang up on even if it drags a little sometimes. We'll see how this adjustment holds up over time. If this doesn't work, I can still try the other, more invasive, methods. After all the work I'd done on this loco, I realized that it didn't have a crew. A little scrounging through my box of figures yielded these two. The Big Hauler cab doesn't have a lot of room in it but this figure made an acceptable engineer and he actually fit. The fireman is a stock Bachmann figure that comes with some of their locos. It's been 2 years and the loco is still running fine. I used it today to pull a modified Aristo track cleaning car as the layout hadn't been run all summer. Even on track that hadn't seen any cleaning in months, the power pickup was good enough to do the job. However, the loco isn't very good at sweeping leaves. Locos with more weight on the lead truck will run over and crush dried ivy leaves, this one will not. The pilot truck derails on leaves that are not swept off by the pilot. Once the leaves were cleaned up manually, it ran fine. I did find that it was heavy enough to spread the rails on sections with rotted Aristo tie strips and it would simply sink into the track at those spots and derail. The tie strips need to be replaced. This page has been accessed times since 17 Dec 1997.